After being in this wrap game for over a year now I have learned that NO MATTER WHAT the design is the most Important, Time consuming, and Expensive part of the VEHICLE WRAP process. From concept to getting the images that the client will have the WOW factor from to making the wrap design fit correct on the vehicle. We like to keep things BIG and SIMPLE because don't forget a vehicle is usually moving so your message needs to be sent to the potential customer FAST and CLEAR. I always say less equals more. Big clear digital photo images with a quick message, company name, phone number, web address, and that's about it. Yesterday We here at Apple Graphics met with a client to get a design complete. We try to do our best to get a feel for the clients personality, what stimulates them visually, and also put our input as well. (After all this is what we do. WRAP VEHICLES. Sometimes it is difficult to come to a happy medium between Me, owner of Apple Graphics, the designer, and the client but we seem to get the job done every time. Doing things through e-mail is ok but to really get on the same page it is always better to set up an appointment and do the design in person here at Apple Graphics philadelphisvehiclewraps.com. If we do not have a template of the vehicle being wrapped is also best to bring your vehicle to our shop for photos and physical measurements. Logo design is also something that comes into play when the company getting the wrap is new in business. We have in house and freelance designers that specialize in logo designs and concepts. 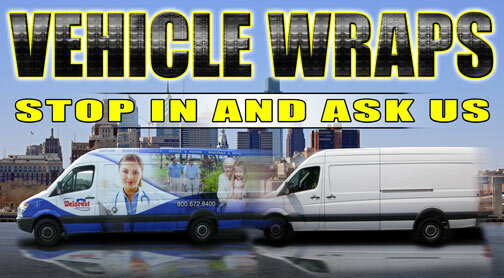 If you have any questions about the design process or vehicle wraps feel free to call 215-322-WRAP(9727). We specialize in getting you noticed with car wraps, van wraps, suv wraps, box truck wraps, wall wraps, race car wraps, signs, banners, and more. Thanks for checkin in and a shout out to Jay from 609 who stopped in last night(Vehicle Wraps run through this guys veins) hope to do a project with you.